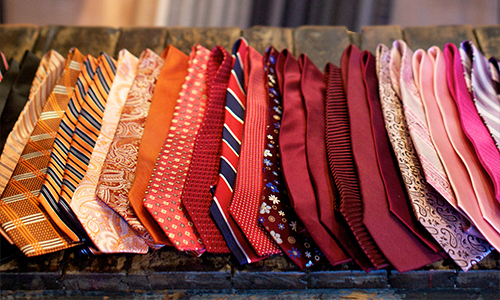 Rich, colorful Italian handmade neckties in silk, wool, knit, and other textures, $110+. Step up your sock game with stylish colors and prints, made in a luxurious yet durable pima cotton blend, $30. Cuff links in both classic and eye-catching accent colors, $75+. Pocket squares made in Italy, Turkey, Chicago, and in assorted colors, patterns, and materials, like silk, wool, linen, cotton and more, $65+. Handcrafted in the USA, these leather belts are made just for you. Select a leather, buckle, thread color, and monogram, $225+. Exclusive to bespoke tailors, Deumer 1863's Bespoke 925 sterling silver cuff-links are available in 6 different shapes and 6 semi precious stones or 12 different precious enamel colors to be put on either side of the cuff-link, engraving additional, $225+. Perfect Gifts for the Groom, Groomsmen, or any occasion. Group discounts available. Step up your tie game with whimsical patterns and colors from Chicago based Lee Allison ties company. Solids and wedding colors also available, $110. Studs are a must have for any tuxedo shirt. Step up your game with mother of pearl, or choose from other stud set finishes. We also carry suspenders, or braces, with traditional button attachment, and the cumberbund for those bound in tradition.